The Volentix digital assets ecosystem announces it plans to allocate 800,000,000 VTX, the native digital asset of the Volentix project, to support an ecologically-sound solution to authentication of transactions on the VDEX decentralized cross-blockchain exchange being constructed on customized EOS.io technology. 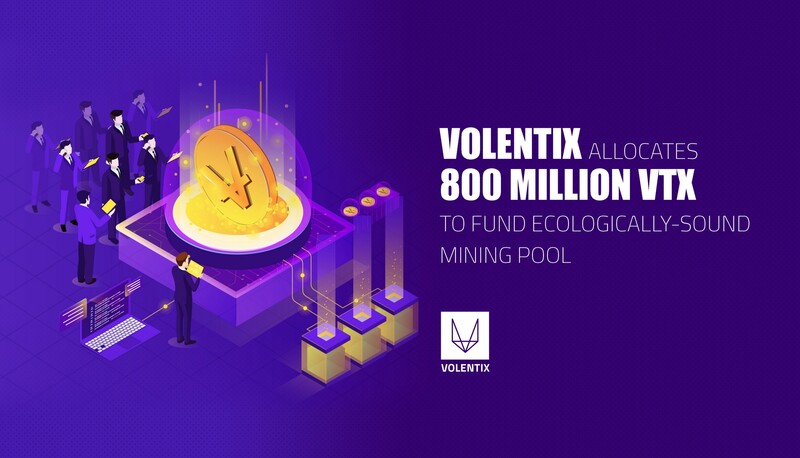 Volentix plans to authorize a total native digital asset supply of 2.1 billion VTX for all purposes, including 1.3 billion VTX as a circulating supply and 800,000,000 VTX to support a draw-down mining pool for transaction authentication. Volentix previously announced it expects to make 455,000,000 VTX of the 1.3 billion VTX circulating supply available to fund community proposals to the Volentix decentralized autonomous organization governing the Volentix digital assets ecosystem. From the VTX circulating supply, Volentix also plans to make available a quantity of up to 364 million VTX for private and public sales toward a hard cap capital raise of USD48.5 million. For further details and updates, please visit the official volentix.io website.